Twenty Minutes atop Puowina.—In the deep dark morning of this past Wednesday, we climbed atop Puowina to gaze upon the efforts of the King, which was joined in by the Chiefs and the makaainana to grow trees with the royal ones. The fence surrounding the plants are still secure but of the maybe four hundred or more trees that were planted, it appears only about a hundred or more trees are growing. Most of them are dead. The weeds that were cut down before the planting are growing as well, and the area where the planted trees are growing is on the Ewa side. The two reservoirs have gone dry, and the reservoir on the Waikiki side is from the rain. There are some clumps of sugarcane and banana plants growing, and if their fruit ripens, they will be savored. Outside of the fence, the wild cattle are grazing on the grass. We climbed up amongst the plantings for twenty minutes, and that was sufficient. 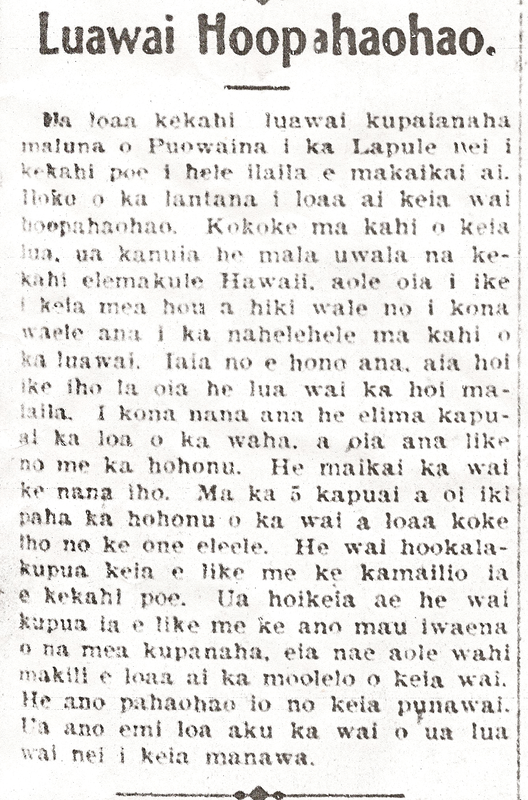 More on Lunalilo’s birthday, 1874. The day passed partially in happiness and partially in sadness. Being that the one whose day this holiday of the lahui is for is there languishing in weakness. The celebration here for his 39th birthday was held peacefully with proper cheer. With the break of dawn of the morning of Saturday, the town was rattled by the boom of the cannons from the battery of Puowina.¹ Before the passing of 11 o’clock, out came the firemen as they paraded on the streets with their fire trucks decorated with the verdure of the forest and flowers, until they returned once again to their station. At each fire station, they had prepared a banquet for themselves while their fine friends were invited to share in this with them. When 11 o’clock arrived exactly, cannons were shot off again from Puowina, along with the warship, Tenedos, which was docked in the harbor; and in the evening as well, cannons were shot off a third time from Puowina. Parties were held at many places, and the streets were teeming with people and those on horseback. All of the flagpoles on land and those on the ships were decorated with flags; the warship Tenedos was adorned from bow to stern. The nature of the day and its sights were peaceful; there were no commotions aroused, nor were there many drunken people seen on the streets. ¹Puowina is one of the many variants for what we see mostly as Puowaina today [Punchbowl]. 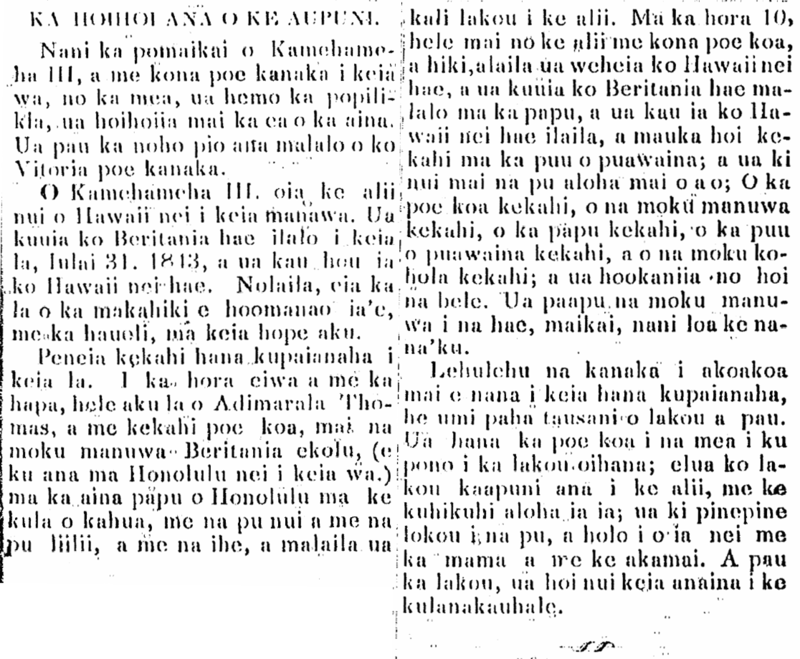 Ko Hawaii Ponoi, Buke I, Helu 34, Aoao 2. Feberuari 4, 1874. The Newspaper “He Hawaii.” [The Hawaiian]—This is a new haole newspaper just published by the Printers of Black and Auld of this town, and it will continue to be published on the 15th of every month throughout the year. It is the same size as “Puowina” [Punchbowl], which rests the eternal rest; and it will be full of intelligent offerings, foreign and domestic news, and other matter found fit by the editors. We hope to see it progress. 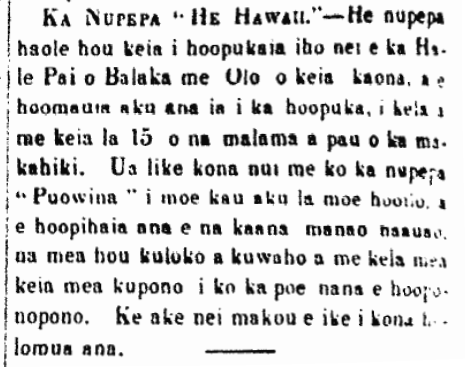 Ka Nupepa Kuokoa, Buke XI, Helu 4, Aoao 2. Ianuari 27, 1872. Punchbowl to go to the rich, 1912. Honolulu, Aug. 10—The government has set aside the home lots at Puoina [Punchbowl] to be auctioned off. The prices have gone much higher than their value. What is so sad is that some homes which have been lived in by people for a long time will go to those who have a lot of money. When these people who have homesteaded on these lands for many years in the past learned that their homes will go to the rich, some sat down in chairs and cried in despair over all the long years spent saving. How sad for those people who will lose their homes! This is one of the things that Representative Kuhio opposes in the administering of the government by Governor Frear, that being the putting up for open auction lands suitable for Homesteads. It is clear that the poor will be crushed by the wealthy. Listen, oh you poor people, think carefully about your Representative of Honolulu, and choose a Representative who supports Kuhio, the one who is fighting for the rights of the poor Homesteaders [na poe Home Hookuonoono]. Ka Hoku o Hawaii, Buke 7, Helu 12, Aoao 1. Augate 22, 1912. An amazing pond was found atop Puowaina by some people who visited there; they found this amazing waters among lantana plants. Close to this pond was planted a patch of sweet potatoes by an old Hawaiian man; he did not know of this new thing until he was weeding near the pond. While he was working [hono ana ? ], to his surprise, he saw this pond their. When he looked at it, its mouth was five feet long, and so too of the depth. The water is five feet or more then you reach black sand. According to what some people say, this is magical waters. It is said to be kupua water, like what is common among amazing things, but there is no trace of the story of this water. It is truly a mysterious spring. The water in the pond these days has somewhat receded. 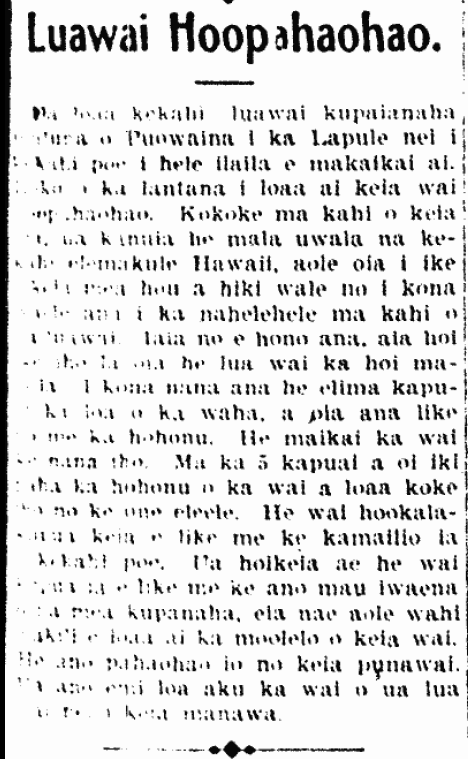 Ka Nupepa Kuokoa, Buke XL, Helu 26, Aoao 5, Iune 27, 1902. Ka Nupepa Kuokoa, Buke XL, Helu 26, Aoao 5. Iune 27, 1902.